So the Primary and Diacetyl Rest had been completed and it was time to move to the lagering stage. 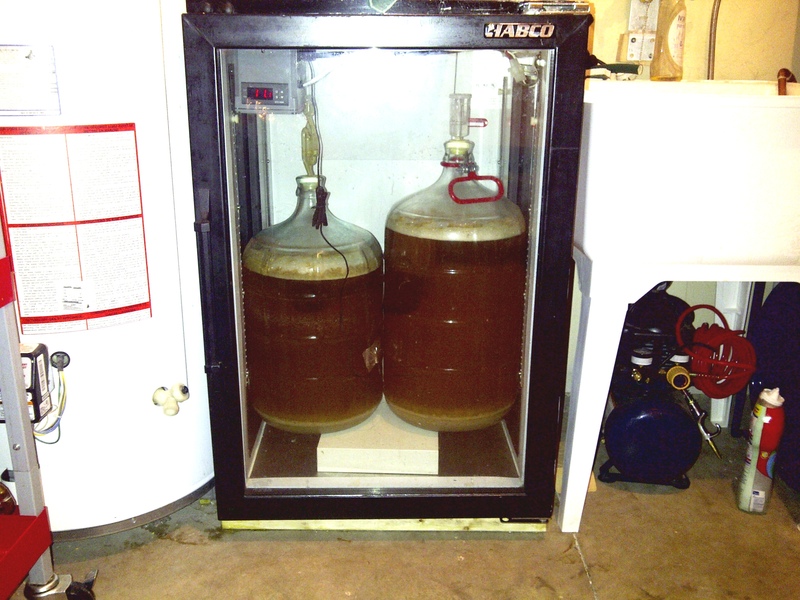 The first two stages took place in a glass carboy, which is a great way to see what’s taking place during fermentation. Ale’s are considered ‘top fermenting’ in which the yeast tend to sit on top of the beer, and lagers are considered ‘bottom fermenting’ in which the yeast sit on the bottom of the fermenter to do their work. This isn’t really true. During primary fermentation, if you use a glass carboy, you can see the beer churning and mixing vigorously as if its in a blender. The yeasties are actually swirling around, eating sugar, and spiting out alcohol and co2. The co2 is a gas that rises out of the liquid and blurbs out the airlock. Well this motion of co2 rising out of the wort/beer creates this churning affect which is great for keeping the yeast in suspension. 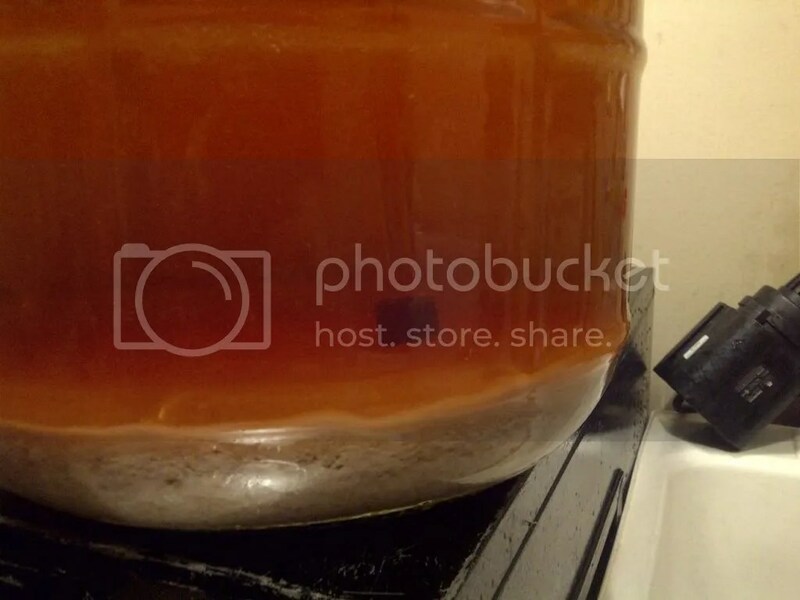 From what I’ve noticed though, lager yeast does pack down on the bottom of the carboy after the vigorous stage and continues to do its work from there. I could see little co2 bubbles rising up from the bottom of the yeast cake – something that I haven’t see ale yeast do. Once the primary was over I simply raised the temperature up a bit to do the diacetyl rest. This rest allows the yeast to work more quickly (yeast work faster with higher temperatures) to finish cleaning up their mess, diacetyl. It’s an off-flavour that makes the beer taste like corn and cooked vegetables. I did actually notice a bit of a corn smell to the beer when I started the diacetyl rest, so its a good thing I did this step. I had an open package of Mount Hood hops sitting in my fridge that I thought that I would use to ‘spice’ things up. So I extended the diacetyl rest a little bit and added the hops directly to the beer in the primary. Dry hopping is a great way to add fresh hoppy aroma to a beer. When I racked the beer over to the keg I could smell the delicious aroma of the hops. Fantastic. However, this may be in vein since hop aroma diminished with time. So after a month long lager I may loose quite a bit of this wonderful aroma. Meh, oh well.. So instead of just racking this beer to another glass carboy, lagering for a month and then moving it to a keg, I’ve decided to skip a step. I just racked the beer directly to the keg and stuck it in my beer dispensing fridge. This way I free up my fermentation chamber for another beer. This was a bit of a chore though because I first had to bottle all of the Clean the Cupboards Ale first. So the taps are dry for the next month, but at least I have bottled beer in reserve. Near the end of the lagering I will add in Gelatin, a fining ingredient, which will latch on to any suspended particle or yeast and drop it right to the bottom of the keg thus clearing the beer further. I hope to see crystal clear beer in the end. So here is the hidden detail in all of this. I actually brewed two lagers, not just one. The other lager is one that I brewed later in the day with my friend. He paid for all the stuff so I was able to brew two beers, one for him, one for me. Not a bad deal. 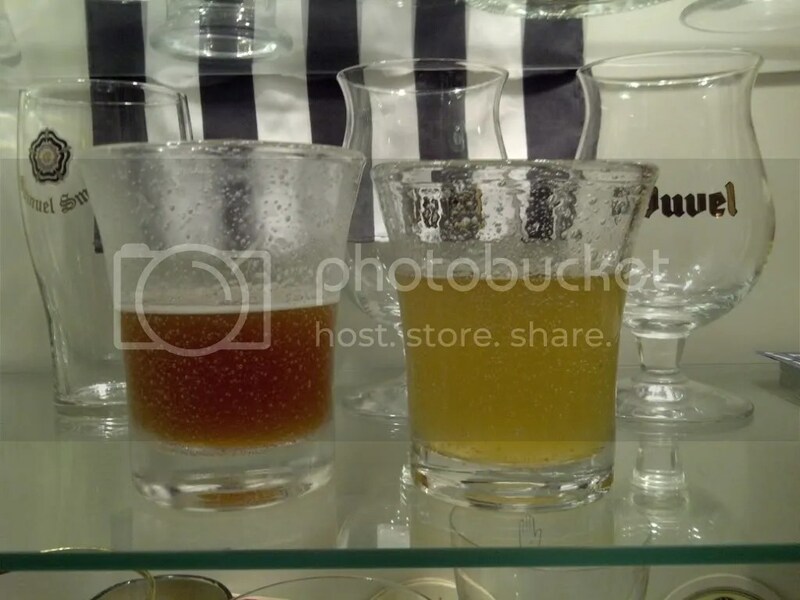 Both lagers have the exact same recipe and ingredients and yeast (I just made a big starter and split it in two for each beer), but there are differences. His beer is 5 gallons, 4.5%, and lime juice and sea salt will be added to it before bottling, thus making “Al’s Lime Lager”. My lager, with the same recipe, ended up being smaller in volume since I only have one 6 gallon carboy and a bunch of 5 gallons. So it ended up being 4 gallons, 5.5%, and dry hopped with lovely Mount Hood hops. This all worked out perfectly because I had the space in the fermentation chamber for both of them. 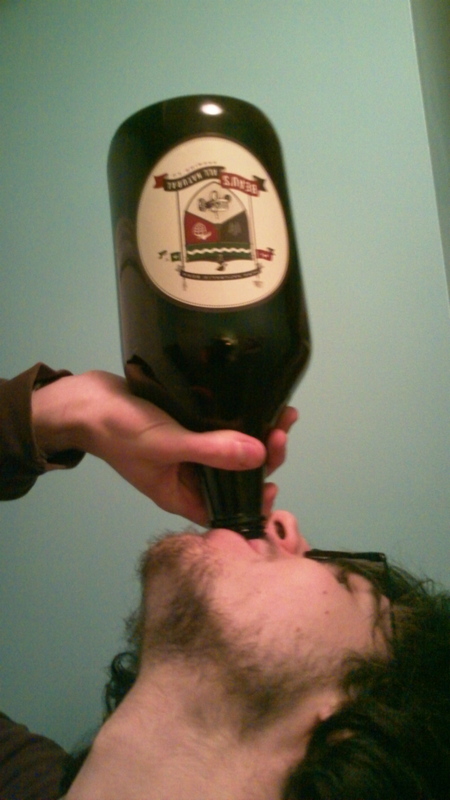 I had a chance to swip a small sample of Al’s Lager to see how it tastes. I had a small sample of mine and it was pretty light and hoppy, but I was more interested in the other lager because it has not been messed around with. I included a picture of the Clean the Cupboards Ale beside Al’s Lager. Stupid me though!! I put them both in frosted glasses – I don’t know what I was thinking. But you can get the sense of the lager being very clear already, from the clear beer in the carboy and it compared to the Clean the Cupboards Ale (which is quite clear itself). Its going to end up looking like a crystal clear light beer, which is exactly what we are shooting for. How does it taste? Well, not carbonated, obviously. Drinking non-carbed beer is difficult to judge, but I am very pleased with the results. First off, I don’t detect any diacetyl – no cooked corn or vegetable flavour or aroma. Its quite light in taste with a fairly dry finish (dryness is enhanced with carbonation and a cold serving temperature) which is perfectly on target. It has a light grain taste that is mildly sweet. Sort of like the Nickel Brook Organic Lager, but less of the grainy taste. So for now I am extremely happy with the results, even though it is a lager. I might have to make it again if it turns out well and I get tired of Ale’s (which isn’t very likely to happen). Up next I have planned a Quad that I am dubbing the “Belgian Bomb”. It will be around 11.5%, 22lbs of grain, candi sugar, and Belgian Ardennes Yeast (yeast strain from La Chouffe). I will brew this and let it sit for a year before I touch it. I think I’m compensating for brewing a wimpy light lager. Obviously I haven’t been up to nothing this whole time. It really looks like Beer for Breakfast has taken a turn from consumer to brewer. Is this because we have sampled every single beer ever created (or that the LCBO permits us to try) and yearn for more? Or perhaps we desire beers that have more complexity and unique tastes to suit our personal preferences.. So while everyone is dreaming and brewing up these delicious brews, I’ve decided to make a bad brew… a boring lager. Crisp, clean, plain, not very strong.. lager. Well, its a challenge. Its technically more difficult to achieve a flavorless lager than a bold and beautiful ale. If I can pull this off then I will have learned just a little bit more about brewing After all, Lagers are the most popular beer in the world. Sounds crazy, but its true. So to ‘feed the masses’ I have crafted my own lager. I will do a follow-up rating on it in a few months when its ready. But to give the per-cursor of brewing the lager I’ve give a few details. * An ode to the cracked windshield on my Chevy Malibu. Gives the beer a real good ‘Mass Produced” vibe to it doesn’t it? All grains mashed at 150F for 90 minutes. Mash out and sparge at 168F for 15 minutes. Part of the challenge of producing a Lager is the strict temperature control of the fermentation. To achieve this I am using my commercial refrigerator that I picked up used, and an aquarium temperature controller that I got off Ebay for $17. The temperature controller will allow my to set the fridge to a temperature range that is optimal for this lager. The other challenge was having enough yeast to do the job. Lagers need a lot more yeast than their ale counterparts. I started a week early with a liquid Wyeast activator packet and went through a few yeast starters to grow a healthy amount of yeast. 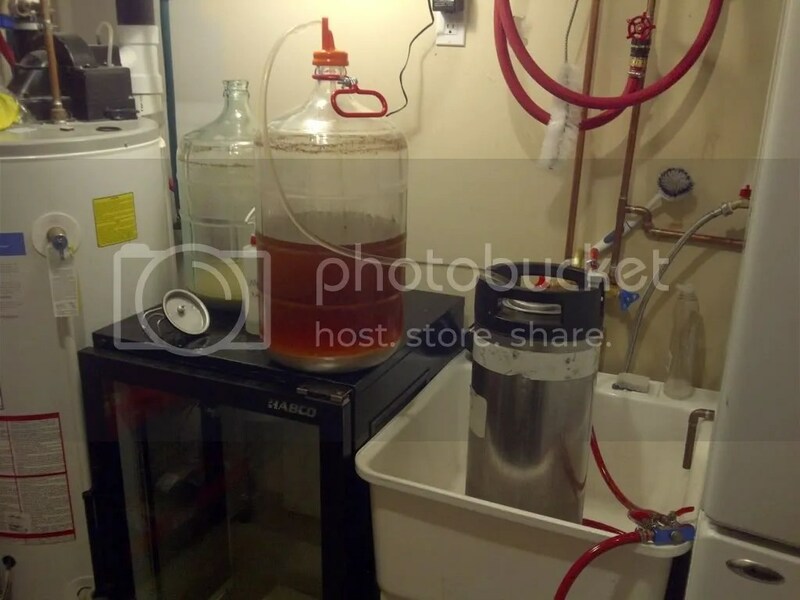 There quite a few other issues with brewing lagers, such as water profile, mash ph level, lower mash temperatures to achieve a more fermentable wort, longer boil times to remove DMS, and a few other issues that I will go into more detail with in the followup post. Sorry about the crap photo – cell phone camera. So.. What’s the Good News? Gentlemen! Save your spent grains, head to the kitchen and put your chef hat on. 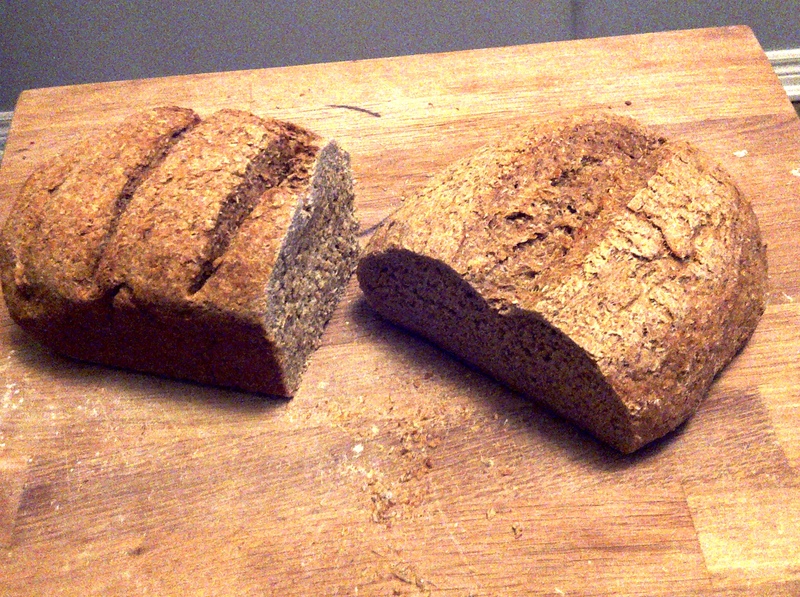 I found a few easy recipes to use the spent grains from brewing to make delicious bread. I will post up a full recipe later when I take a second crack at it. I made two loafs of bread during the middle of the lager brew day (insane?) which turned out decent. I should have left more time for the bread yeast to rise the dough because I ended up with a pretty dense bread, but its bread none the less. Sorry for the crap photo quality again.. Beyond the Lager & Bread, I also have an IPA that is almost ready to sample (which I will do a post about) and I have a monster Belgian style brew planned for later this month (21 lbs of grain, crap load of hops, ~11%, will leave it to age for a year before I even look at it). Exciting times are ahead for Beer for Breakfast. This straw-yellow European style lager is a little on the lighter side, with an alcohol content of 4.2%. The aroma is soft and fresh with a hint of distinctive skunk, and goes down smooth and crisp. A light, malty taste with little bitterness and a dry, astringent finish. A prime example of a beer that you could drink all night because it goes down so easily and is actually quite thirst quenching. Without a doubt another success story for Mill St. This beer can pretty much be found anywhere, which is a tribute to just how popular it has become. I have never tried this particular beer on draught and I look forward to sampling it in the future, mainly because in the bottle it has been conditioned for 5 weeks before being distributed. So, my deductive reasoning says that without the short aging process this beer could potentially be very different. I wonder if there is a lot that can change in a beer over the course of 5 weeks? Maybe there is. I guess I am going to have to find out. Plus, it’s organic, and we can’t forget about that little detail, can we? 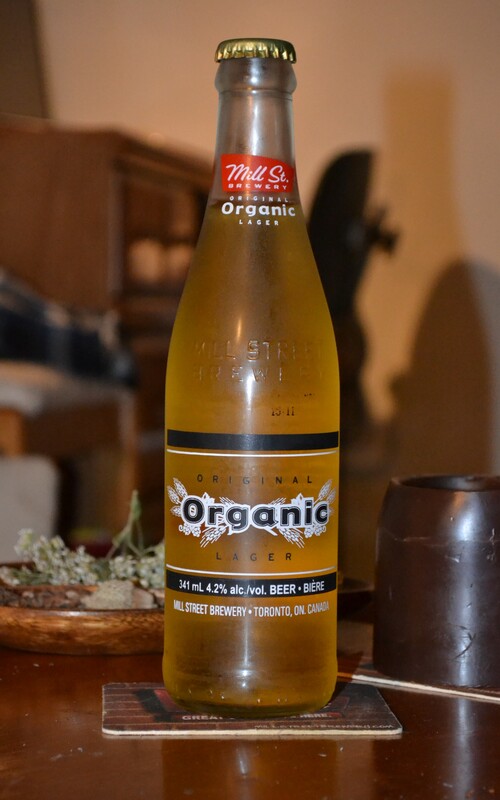 Might not seem like a big deal, but organic beer takes 2-3 times longer to brew and the ingredients are much more expensive because the barley and hops haven’t been blasted with insect neurotoxins. Tastes good, and it’s pretty good for you too. Could be a bit more flavorful, but Mill St. certainly achieved what they were going for. 2.75 heads.